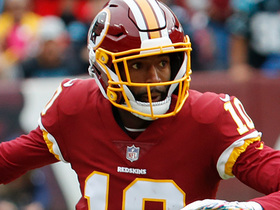 Richardson (shoulder) is one of the leaders of a Washington wideout group that lost Jamison Crowder to the Jets and Maurice Harris to the Patriots in the opening days of free agency, JP Finlay of NBC Sports Washington reports. The Redskins placed Richardson (shoulder) on injured reserve Monday, Kareem Copeland of The Washington Post reports. Richardson is facing a timeline of 6-to-8 months for his recovery from season-ending shoulder surgery, Mike Garafolo of NFL Network reports. Richardson will have season-ending surgery to repair the AC joint in his shoulder, John Keim of ESPN.com reports. Richardson caught two of six targets for 16 yards in Sunday's 38-14 loss to Atlanta. Richardson (shoulder/knee) is active for Sunday's game versus the Falcons, Kareem Copeland of The Washington Post reports. Analysis: Among Richardson's injuries, the Redskins seem to be more worried about his shoulder in the long term. On Friday, coach Jay Gruden told Copeland that Richardson may have his shoulder examined in the offseason, suggesting surgery is a possibility. Such a decision is still months away, though. In the near term, Richardson will look to exploit an Atlanta defense that has allowed 9.3 YPT and 12 touchdowns to wide receivers in seven outings this season. Richardson (shoulder/knee) is listed as questionable for Sunday's game against the Falcons, Kareem Copeland of The Washington Post reports. Richardson (shoulder/knee) was limited at Thursday's practice. Analysis: According to John Keim of ESPN.com, Richardson participated in individual drills, so his progression to limited participant Thursday is no surprise. Richardson maintained that level of activity all of last week before returning from a one-game absence this past Sunday against the Giants. If he does the same Week 9 versus the Falcons, he could take advantage of a receiving corps that will be without Jamison Crowder (ankle) and potentially pass-catching back Chris Thompson (ribs). Richardson (shoulder/knee) was a non-participant at Wednesday's practice. Richardson caught two of five targets for 34 yards in Sunday's 20-13 win over the Giants. Analysis: Listed as questionable with shoulder and knee injuries, Richardson got the start and handled his usual workload. He's yet to see more than six targets in a game this season, with Adrian Peterson shouldering the load in what has unexpectedly become a run-first offense. Richardson does get a gorgeous matchup with the pitiful Atlanta defense Week 9. Richardson (shoulder) is listed as active Sunday at the Giants. Analysis: Richardson managed limited practices all week, but a comment from coach Jay Gruden on Thursday indicated the Redskins were unsure of the wideout's ability to return. In essence, Gruden said Richardson must have his knee monitored after activity to make sure there are no setbacks. After clearly passing every test this week, Richardson should head a wideout group without Jamison Crowder (ankle), though Chris Thompson (ribs/knee) and Jordan Reed are better bets to lead the team in targets. Richardson (shoulder) is listed as questionable for Sunday's game against the Giants, John Keim of ESPN.com reports. Analysis: Although he may be listed as a limited participant once again, Richardson appeared to be moving without much trouble during Friday's practice. His shoulder is no longer viewed as a major concern, but coach Jay Gruden did mention Thursday that the team needs to see how Richardson's knee responds to the week of practice. It thus seems quite possible the wideout will come down to a game-time decision ahead of Sunday's 1:00 PM ET kickoff. Coach Jay Gruden said he's "hopeful" Richardson (shoulder/knee) will be able to suit up Sunday against the Giants, JP Finlay of NBC Sports Washington reports. Richardson (shoulder/knee) was a limited participant in Wednesday's practice. Analysis: Richardson was held out of practice all last week and sat out Sunday's win over the Cowboys after aggravating a knee injury he had been playing through since mid-September. His return to the practice field Wednesday suggests he at least has a chance to avoid a second straight absence when the Redskins travel to New York to face the Giants in Week 8. Meanwhile, fellow wideout Jamison Crowder (ankle) still isn't practicing and looks in danger of missing his third straight contest. Richardson (shoulder/knee) took part in the portion of Wednesday's practice open to the media, Tarik El-Bashir of The Athletic reports. Analysis: Richardson's absence in the Week 7 win over the Cowboys stemmed from an early season knee injury that he aggravated one week prior. With a return to action Wednesday, he may be putting himself on the path to a return Sunday against the Giants. First, Richardson will have to get through the next three days unscathed. Richardson (shoulder/knee) is inactive for Sunday's game versus the Cowboys. Richardson (shoulder/knee) is listed as doubtful for Sunday's game against Dallas. Richardson (shoulder/knee), who didn't practice Wednesday and Thursday, had his knee evaluated by a doctor Thursday, John Keim of ESPN.com reports. Analysis: Among the injuries listed next to his name, Richardson's knee is the more worrisome of the two. Coach Jay Gruden said the Redskins are being "a little cautious" with Richardson, who is dealing with lingering discomfort in the knee, per Keim. Richardson has one more opportunity to make his presence felt in practice this week, at which point the team likely will give him a 'questionable' tag for the fourth time in six games in 2018. Richardson (shoulder/knee) isn't participating in Thursday's practice, John Keim of ESPN.com reports. Analysis: Neither the shoulder nor the knee issue is a new concern for Richardson, but it's somewhat disconcerting that he'll be a spectator for the Redskins' first two practice sessions of the week. While he hasn't missed any games this season, Richardson has been listed as questionable heading into three of the Redskins' five contests. Richardson could follow a similar path in Week 7 if he isn't a full participant in Friday's practice. Richardson (knee/shoulder) didn't practice Wednesday, David Helman of the Cowboys' official site reports. Analysis: Richardson was also held out of practice Wednesday and Thursday last week, eventually returning Friday as a limited participant. 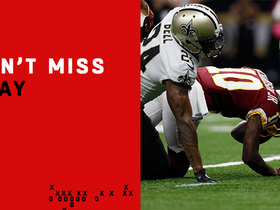 He went on to handle his usual workload in a 23-17 win over Carolina, catching three of five targets for 31 yards and a touchdown while playing 74 percent of the Redskins' offensive snaps. Listed with the same pair of injuries this week, Richardson should be fine for Sunday's game against Dallas so long as he practices in some capacity Thursday and/or Friday. Richardson (knee) hauled in three of his five targets for 31 yards and a touchdown in the Redskins' 23-17 win over the Panthers on Sunday. 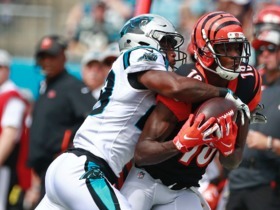 Analysis: Richardson shed his questionable tag prior to the contest and then made a key fantasy contribution with a three-yard touchdown catch late in the first quarter. Richardson still only saw a modest five targets despite the absence of both Chris Thompson (ribs/knee) and Jamison Crowder (ankle), so his volume in this offense appears to be relatively locked in regardless of circumstance. Richardson will look to up his numbers against the Cowboys in a Week 7 divisional matchup. Richardson (knee) is active for Sunday's contest against the Panthers. Analysis: Richardson leads all Redskins wide receivers in offensive snap share this season, and he won't be bothered Sunday by Jamison Crowder (ankle) and Chris Thompson (ribs/knee), who were both deemed inactive. On the season, Richardson hasn't been targeted more than six times in a given game, but that number is a reasonable floor with the aforementioned teammates in street clothes. Richardson (shoulder/knee) is listed as questionable and expected to be a game-time decision Sunday against the Panthers, John Keim of ESPN.com reports. Analysis: The same goes for Adrian Peterson (ankle/knee/shoulder), Chris Thompson (rib/knee), Jamison Crowder (ankle) and Josh Doctson (heel). It's an odd situation that could lead to serious volume for tight end Jordan Reed and anyone else who is able to play. Richardson was held out of practice Wednesday and Thursday, but he did return Friday as a limited participant, going through drills without a helmet, John Keim of ESPN.com reports. Richardson (shoulder/knee) was absent from practice Thursday, Kareem Copeland of The Washington Post reports. Richardson (knee/shoulder) wasn't on the field for the start of Thursday's practice, Kareem Copeland of The Washington Post reports. Richardson (knee) was listed as a non-participant on Wednesday's estimated injury report, John Keim of ESPN.com reports. Analysis: The Redskins merely held a walk-through, but coach Jay Gruden said Richardson and fellow wideout Jamison Crowder (ankle) wouldn't have taken part if Wednesday's session included individual and team drills. Richardson's knee injury comes on the heels of weeks tending to a sprained AC joint in his shoulder, so his workload at upcoming practices will be monitored closely to see if he can tough out yet another health issue. Richardson is doubtful to return to Monday's game against the Saints with a right knee injury. Analysis: Richardson was the Redskins' top receiver before exiting, hauling in four of five passes for 50 yards. As Monday's game is unfolding into a blowout in favor of New Orleans, there is not much incentive to put the receiver back on the field regardless of the severity of the injury. With Josh Doctson (heel) already out, Brian Quick should see a significant role in the passing game as long as Richardson is absent. Richardson (knee) was a full participant at Friday's practice, Kareem Copeland of the Washington Post reports. Analysis: Richardson's full session indicates that he will suit up Monday, barring a setback. The fifth-year wideout has battled through a sprained AC joint since Week 1, and now finds himself in a great matchup with a Saints defense that has given up the fourth-most passing yards in the league through four games. Richardson has 14 targets through Washington's first three contests, but could be in for a larger share of the passing game if fellow receiver Josh Doctson (heel) is unable to play in Week 5. Richardson (shoulder) remained limited at Friday's practice, John Keim of ESPN.com reports. 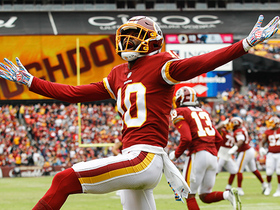 Analysis: Richardson has been playing through an AC joint sprain since Week 1 and doesn't seem to be in much danger of sitting out as the Redskins return from a bye. The real concern is the health of fellow wideout Josh Doctson, who missed practice Thursday and Friday after aggravating a heel injury Wednesday. Maurice Harris would be the clear favorite to join Richardson and Jamison Crowder in three-wideout sets if Doctson were to miss Monday's game in New Orleans. Richardson (shoulder) was limited at practice Thursday, per the NFL Communications site. Analysis: Despite the benefit of a Week 4 bye, Richardson has kicked off preparation for a Monday night visit to New Orleans with a cap on his practice reps. In the two games that he played through an AC joint sprain, he hauled in five of eight passes for 109 yards and one touchdown, so he should be productive, if active, in what should be a high-scoring contest. Richardson (shoulder) participated in Thursday's practice, JP Finlay of NBC Sports Washington reports. Analysis: Richardson has been hampered by an AC joint sprain since Week 1, playing through the pain in the Redskins' next two games. With an early bye Week 4, he seemingly has benefited from the extra time to heal with an appearance at practice Thursday. While he may require further maintenance on his shoulder, he doesn't appear to be in danger of missing Monday's game at New Orleans. Coach Jay Gruden said Richardson's shoulder injury may require continued maintenance, JP Finlay of NBC Sports Washington reports. Analysis: Richardson came out of Week 1 with an AC joint sprain, then played through the injury for two weeks before resting up during a bye. He apparently still has some pain/discomfort, but it doesn't seem to have prevented him from taking part in Monday's practice. Richardson likely will show up on the injury report ahead of a Week 5 game in New Orleans on Monday Night Football. Richardson (shoulder, knee) brought in one of two targets for a 46-yard touchdown in the Redskins' 31-17 win over the Packers on Sunday. Richardson (shoulder, knee) is active for Sunday's game against the Packers. Analysis: Richardson was diagnosed with an AC joint sprain in one of his shoulders prior to Week 2, but the injury didn't stop him from increasing his share of the offensive snaps from 71 percent in the season opener to 92 percent last Sunday. He proceeded to pick up a knee issue this week, resulting in a DNP/LP/LP practice regimen. No matter, he'll tough both of them out against a Packers secondary sans top cornerback Kevin King (groin). Richardson (shoulder/knee), who is listed as questionable for Sunday's game against the Packers, is expected to play in the contest, a source informed Ian Rapoport of NFL Network. Analysis: Richardson managed only a pair of limited practices this week while managing the two injuries, but it doesn't look like either issue will prevent him from playing Sunday. Despite being less than fully healthy for the Week 2 loss to the Colts, the wideout played 68 of a possible 74 offensive snaps and finished with four receptions for 63 yards. Expect Richardson to take on another sizable snap count Week 3. Richardson (shoulder, knee) is listed as questionable for Sunday's game against the Packers, John Keim of ESPN.com reports. Richardson (shoulder, knee) was a limited participant at Thursday's practice, John Keim of ESPN.com reports. Richardson (shoulder/knee) is listed as a non-participant on Wednesday's injury report, Josh Tolentino of The Athletic reports. Updating a previous report, Richardson required an MRI on his shoulder rather than his knee, according to John Keim of ESPN.com. A recent MRI on Richardson's knee came back clean, JP Finlay of NBC Sports Washington reports. Richardson (shoulder) caught four of six targets for 63 yards in Sunday's 21-9 loss to Indianapolis. Richardson (shoulder) is active for Sunday's game against the Colts. Richardson (shoulder), who is listed as questionable for Sunday's contest against the Colts, will be a game-time decision, Ian Rapoport of NFL Network reports. Richardson (shoulder) is listed as questionable for Sunday's game against Indianapolis, Kareem Copeland of The Washington Post reports. Richardson (shoulder) was added to the injury report Thursday and doesn't appear to be practicing Friday, John Keim of ESPN.com reports. Analysis: Despite being listed as a full participant for Thursday's session, Richardson may be in danger of missing Sunday's game against the Colts. Another update should be available when the Redskins release their final injury report Friday afternoon. Injuries have already taken a toll on Washington's wideout depth, with Maurice Harris still recovering from a concussion and both Trey Quinn and Cam Sims placed on IR due to ankle injuries. Richardson caught four of six targets for 22 yards in Sunday's 24-6 win over the Cardinals. Analysis: Richardson played 77 percent of snaps on offense and finished second on the team in targets, but he struggled to make anything of his opportunities. He should be more efficient Week 2 against a soft Colts secondary, though it may not be a great matchup for Washington's cumulative passing volume. Richardson caught two of three targets for 31 yards in Friday's preseason game against Denver. 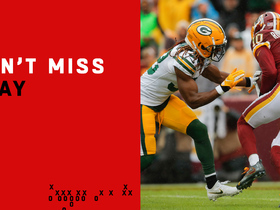 Analysis: With Jamison Crowder (groin), Jordan Reed (toe) and Chris Thompson (leg) all held out, Richardson and Vernon Davis accounted for seven targets on Alex Smith's eight pass attempts. Richardson is locked in as a starter with the potential for heavy snap counts, but he'll have a hard time finding more than a handful of targets per game if the Redskins can keep all their key pass-catching threats healthy. The team seems to expect Crowder, Reed and Thompson to all be ready for Week 1 against Seattle. Richardson caught his lone target for an eight-yard gain in Thursday's preseason game against the Jets. Analysis: Richardson got the start and logged 10 snaps, with his reception coming on the first play of the game. Signed to a five-year, $40 million contract this offseason, the former Seahawk has a spot in three-wide formations locked down, but he might be the odd man out when Washington keeps two tight ends on the field. It isn't clear if Richardson, Josh Doctson or Jamison Crowder (groin) will typically come off the field in those situations. 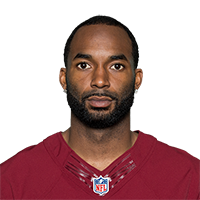 Richardson's five-year, $40 million contract with the Redskins includes $12.5 million fully guaranteed at signing in the form of a $10 million signing bonus, his $1.5 million base salary for 2018 and $1 million of his $5 million base salary for 2019, Rich Tandler of NBC Sports Washington reports. The Redskins and Richardson officially agreed to a contract Thursday, Stephen Czarda of the team's official site reports. Richardson is expected to sign a five-year, $40 million deal with the Redskins later this week, Mike Garafolo of NFL Network reports. Richardson, an impending free agent, sent out a tweet suggesting he doesn't expect to re-sign with Seattle. Richardson was inconsistent but nevertheless set career highs across the board in 2017, catching 44 passes for 703 yards and six touchdowns. Richardson snagged two of seven targets for 18 yards during Sunday's 42-7 loss to the Rams. Richardson brought in three of seven targets for 72 yards and a touchdown in Sunday's 30-24 loss to the Jaguars. Richardson snatched two of four targets for eight yards during Sunday's 24-10 win over the Eagles. Analysis: The eight yards marked a season low for Richardson, who has had had a bit of a renaissance during his fourth year in the league with for touchdowns and six games of at least 50 yards. He's slowed down a bit as of late and has not reeled in a score in his last five games. He has a firm grasp on the No. 2 wideout job in Seattle but gets another tough test this coming week against the Jaguars. Richardson reeled in four of seven targets for 70 yards during Sunday's 24-13 win over the 49ers. Richardson (groin) hauled in one of two targets for 43 yards in Thursday's 22-16 win over the Cardinals. Analysis: Richardson made his one catch count, posting his second reception of over 40 yards on the season. The 25-year-old speedster's six-catch effort in Week 8 against the Texans was essentially an outlier, as he's managed no better than three grabs in any other game. Richardson will now have an extended period to rest his ailing groin and ready himself for a Week 11 showdown with the Falcons on Monday Night Football. Richardson (groin) is listed as active Thursday at Arizona. Analysis: Richardson tended to hamstring tightness on a short week, resulting in DNPs both Tuesday and Wednesday. That said, he's available to the offense Thursday in what's expected to be a limited capacity. Considering he's averaging a whopping 10.6 YPT and leads the Seahawks with five touchdowns, he's a decent option in most formats. Richardson (groin) is expected to suit up for Thursday's game at Arizona, but his snap count may be limited, Adam Schefter of ESPN reports. Analysis: Richardson has been an effective No. 2 wideout behind Doug Baldwin this season, turning in the fourth-most targets (39) on the Seahawks into 52 yards per game and a team-high five touchdowns. While a tight hamstring kept Richardson out of practice both Tuesday and Wednesday, he's expected to suit up Thursday, albeit in a limited capacity. Richardson (groin) is considered a game-time decision for Thursday's matchup with the Cardinals, Ian Rapoport of NFL Network reports. Richardson (groin) is listed as questionable to play Thursday at Arizona, Curtis Crabtree of Sports Radio 950 KJR Seattle reports. Analysis: Richardson appeared on the Seahawks' injury report both Tuesday and Wednesday as a non-participant, but head coach Pete Carroll called the development the result of "some tightness" in the wideout's hamstring, per John Boyle of the Seahawks' official site. In the end, Carroll expects Richardson to be "OK" for Thursday's divisional showdown, but the wideout's status will be confirmed when the team releases its list of inactives approximately 90 minutes before the 8:25 p.m. EDT kickoff. Richardson was added to the Seahawks' injury report after failing to practice Tuesday due to a groin injury, John Boyle of the Seahawks' official site reports. Analysis: Richardson was a full participant during Monday's walkthrough, but it appears he may have picked up the injury in Sunday's loss to the Redskins. While the team is likely exercising caution with the 25-year-old pass catcher due to the short week, the situation will still need to be monitored going forward. Tyler Lockett and Tanner McEvoy would presumably see increased roles should Richardson ultimately be unable to go Thursday against the Cardinals. NFL Network's Ian Rapoport reports the details surrounding the season-ending injuries to the Washington Redskins. Washington Redskins wide receiver Paul Richardson runs a nice route to get into open space for a 25-yard completion. 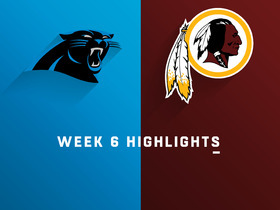 Watch the highlights from the Carolina Panthers vs. Washington Redskins Week 6 matchup. Check out this pass from Washington Redskins quarterback Alex Smith as he finds wide receiver Paul Richardson in the back of the end zone for a touchdown. Washington Redskins wide receiver Paul Richardson reaches high for a 23-yard catch from Washington Redskins quarterback Alex Smith against the New Orleans Saints. Week 3 of the NFL season featured more entries into the Toe Drag Swag vault, one-handed snags and the deep passing attack. Here's a look at the best catches. Washington Redskins quarterback Alex Smith airs it out to wide receiver Paul Richardson for a 46-yard touchdown. 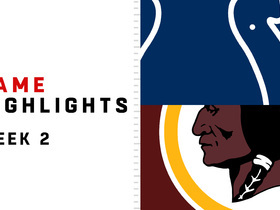 Watch highlights from the Indianapolis Colts vs. Washington Redskins game where the Colts take away a home victory from the Redskins for week 2 of 2018. 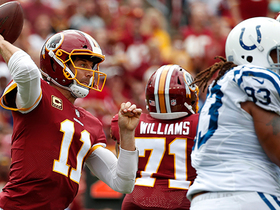 Watch highlights from the Indianapolis Colts vs. Washington Redskins game where the Colts take away a home victory from the Redskins for week 2 of the 2018 season. Washington Redskins quarterback Alex Smith and wide receiver Paul Richardson connect on a spectacular throw for a 34-yard gain against the Indianapolis Colts.